It was with great sadness that I heard that Andy Meikle died this morning, after a long battle with cancer. Andy worked for many many years at Pebble Mill, first of all in the drama department on series like Gangsters and then as a director and producer on factual series like On the House and Gardeners’ World. Andy was an extremely generous, and incredibly practical man – he was brilliant at DIY! I worked with him on the DIY series On the House , when I joined an established team as a brand new researcher. He taught me a lot about researching for factual television, as well as about working with contributors. I remember him being really supportive when I directed my first insert on Gardeners’ World in 1990. He said jokily, ‘don’t you hate it when someone can just do it?’ – I certainly hadn’t been able to ‘just do it’, but knowing that he thought I’d done a good job was really important to me, and really helped my confidence. 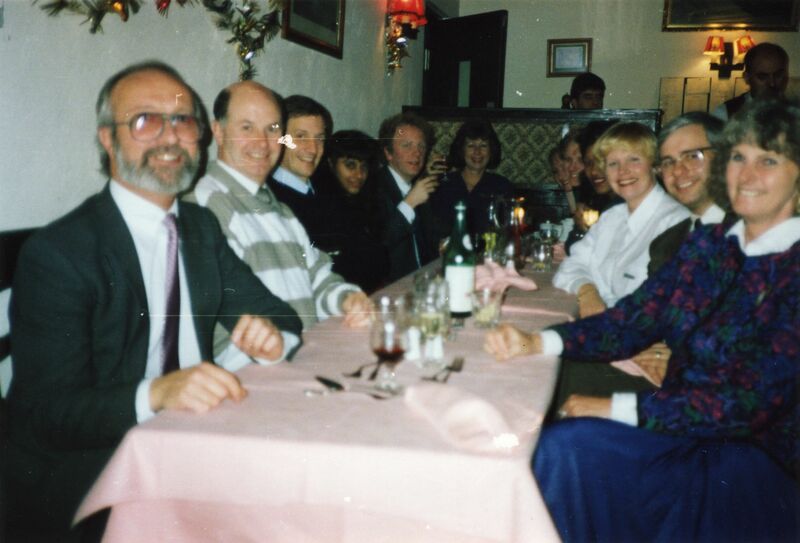 This photo is from the Christmas lunch for the Gardeners’ World production team from 1990. It includes, left to right: Andy Meikle, Denis Adams, Mark Kershaw, Kulvinder Chudge, Nick Patten, Steph Silk, next might be me (Vanessa Jackson) or Ann Holmes, I can’t see enough of the next two girls to identify, then Patti Evans with the blonde hair, Howard Perks, and Gail Herbert (whose photo it is). Andy will be much missed, and our thoughts go out to his loved ones. I was so sad to hear of Andy’s death. I fully endorse Vanessa’s assessment of the man. He was generous, practical and very supportive to younger staff. I worked with him as a floor assistant to his production manager in the late 70’s and early 80’s. Later, I joined him and Steph in setting up On the House, which was his brainchild. Today, we have more home improvement programmes than is good for us, so it’s strange to reflect that when On the House went on air, there had not been a do it yourself series since the late 1950’s or early 1960’s, when Barry Bucknell showed how to streamline doors and banisters with hardboard. Andy noticed the stock market spike in DIY following the Thatcher housing reforms and used it to sell a programme proposal. He wasn’t alone in this, but his simple good nature and practicality served us well in taking a concept through to successful production. His contribution to the developing portfolio of leisure programmes that were to become so evident a feature of Birmingham productions, was marked. However, he had the good sense to see it in proportion. Above all, I look back at a good, warm-hearted man who was a great colleague and friend. Thanks for introducing me to the chip buttie, Andy. OK,- you’re right, they are delicious! So very sad to stumble across this posting about Andy. Many memories of him during the 70’s at Pebble Mill when I was on Pebble Mill at One. Love to Steph at this time. I have my own private and very entertaining memories of my years knowing both Andy & Steph. From the days when I first met Andy and was assigned to teach him how to use a computer. That was the start of many many hours spent trying to figure out how Andy always managed to bring another computer to it’s knees. me why this bloody computer has eaten everything that I’ve just put into it”. me into there life and home as if I were family. Thanks Andy for all the good times and the jokes, thanks for your generosity, warmth, and most of all thanks for being my friend. Time is not the great healer, I will always miss you.